As easily as you can become allergic to someone you see too often of, you can become addicted to someone you don't see enough of. 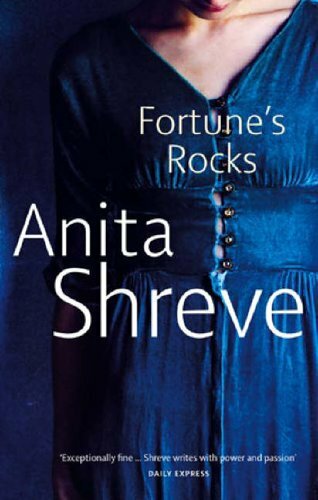 In the last two years of reading Anita Shreve's novels, I have become used to her storytelling. After reading Strange Fits of Passion in February, I seriously thought that I had figured out her style of writing. I was wrong. Fortune's Rocks is told in the third person and in the present tense. In the first sentence of the 453 page paperback novel I borrowed from my neighbour, Shreve cleverly summarises the entire story in one word: DESIRE. The last word in the entire novel sums up the consequences of that desire. While reading it, I was conscious of my resistance to read too much of it too fast. I had to pace myself so that I could enjoy it like a fine wine which I sip slowly to taste its entirety while saving the remainder for as long as possible. This kind of deliberate and conscious reading took me into the story to such an extent that I seemed to be living out the fiction in the nonfiction of my life! Shreve's second sentence captivates the reader to continue: "Desire that slows the breath, that causes a preoccupied pause in the midst of uttering a sentence, that focuses the gaze absolutely on the progress of naked feet ...."
Fortune's Rocks is a fictional place where the events of one summer determine the fate of many people. It is an apt title, for fortune is not without problems (rocks). And what appears to be so perfect on the surface hides what can disrupt and overturn from beneath. In the novel, a home-schooled and sheltered 15-year-old girl, an only child, has a secret affair with her father's trusted 41-year-old married friend. When they are caught in the act in a chapel on the eve of her sixteenth birthday gala party, it causes a scandal and forces a drastic turn of events. The wife divorces him and takes their four children away. The lover loses his job. The girl finds out she's pregnant, but the baby is taken away from her while minutes after birth. The reputation and friendship of two well-to-do families are ruined. While the plot is sizzling, the writing is mesmerising, if you can get into the mind of the desirer and the desired. They know from the moment they meet, despite the age difference and the obviously unacceptable incompatibility of their circumstances, that they desire one another and they are destined to be together. There is an immediate intimacy that they cannot deny. They are aware of what is at stake, but they don't resist each other. Even after they have lost everything and have sacrificed so much, they don't repent. "How can something that feels so true and honest and pure, which is how I must describe my feelings for you, and I do declare them love, which I had not thought possible after so short a time, be so ugly as to cause such pain? And more vexing still, have no happy concluson?" Is it possible to know a person so well that you understand why he does what he does, even if others consider what he does to be wrong or scandalous? Indeed, a Neuro Linguistic Programming supposition says that every behaviour has a positive intention. Read the book, and you will become more forgiving and less critical of what you consider to be wrong or imperfect. Understand the characters, and you will empathise with lovers who desire each other, against all odds.